1. 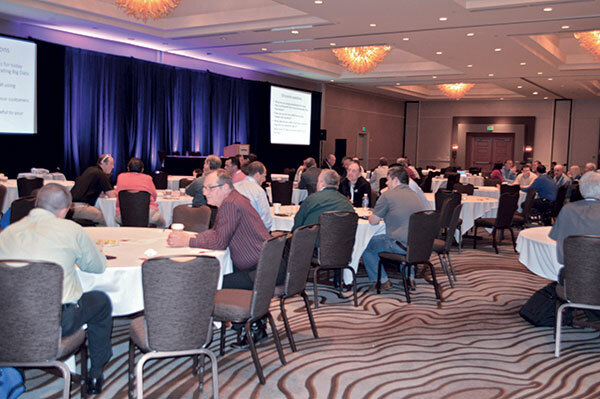 Group discussions gave attendees an opportunity to share ways technology helped or hindered their businesses. 2. Bobby Jenkins explains how and why ABC Home & Commercial Services uses apps. 3. Cleveland Dixon tells attendees why he decided to outsource many administrative-related tasks at Holiday Termite & Pest Control. 4. PesTech3.0 attendees sit in on a panel discussion about using technology to boost sales. 5. Court Parker stressed the importance of protecting company data. 6. ServicePro’s Ka Tsu introduced the panelists who discussed disruptive technology. 7. Attendess were treated to a reception at The Tech Museum of Innovation in San Jose, Calif.
Technology and how pest management professionals (PMPs) can best use it to work smarter was the focus of PesTech3.0, held Jan. 5-7 in San Jose, Calif., an area also known as Silicon Valley. 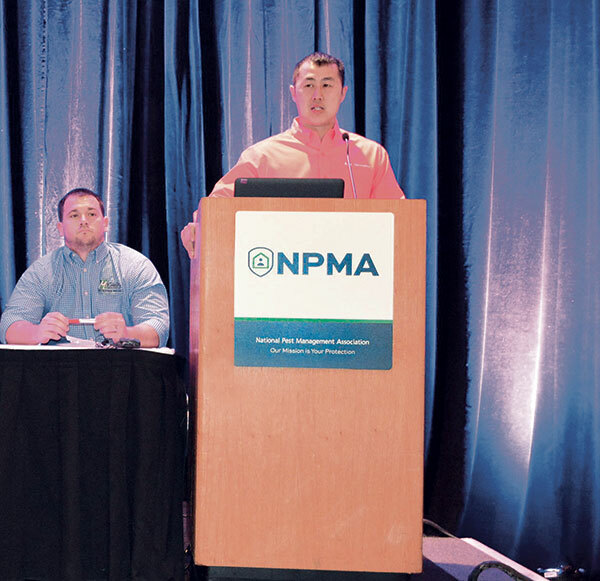 Hosted by the National Pest Management Association (NPMA), the event featured group discussions seminars, presentations and exhibits. Sponsors included PestMate, PestRoutes, ServicePro and WorkWave. 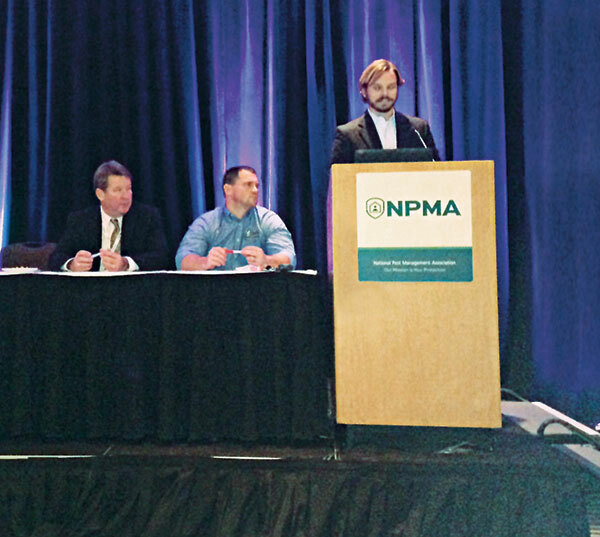 NPMA President Russ Ives kicked off the event by welcoming attendees and encouraging them to learn more about technology over the course of the three-day event. He recognized the Pest Control Operators of California for facilitating the event. Parker (who is also profiled here) offered a cautionary tale about cyber security. His company was attacked not once, but twice, despite his best efforts to protect his assets. His takeaway was for PMPs to be prepared. Cyber insurance is one way for pest management companies to protect themselves, he said. 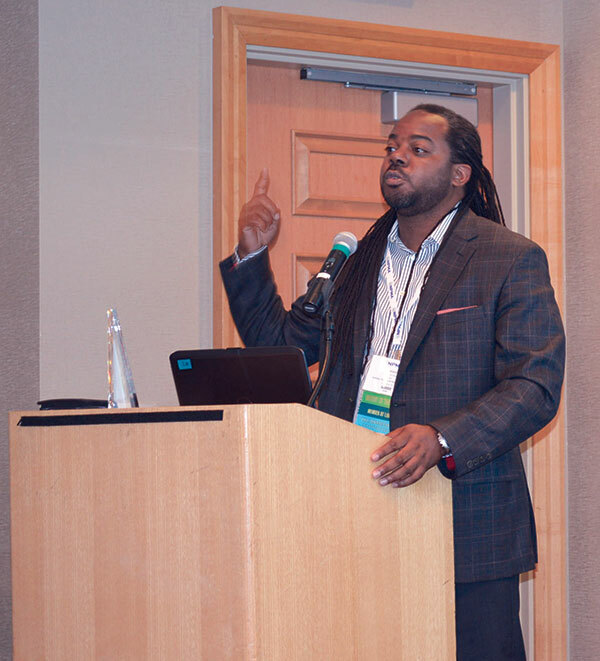 As part of a panel discussion about using technology to increase sales and efficiency, Bobby Jenkins, ABC Home & Commercial Services, told attendees about the apps his company now uses. Cleveland Dixon of Holiday Termite & Pest Control explained the value of outsourcing. He now uses RingCentral, a cloud-based system that operates as a call center, as well as Service Pro’s ServSuite to get customer information into his system, PDF Expert to get job information into his system, and Dropbox to store his files. Most recently, he hired a company to open his mail and scan any checks he receives. Matt Beckwith of Clark Pest Control said his company uses technology to expedite and improve the customer experience. Wearable technology for service companies was the subject of a presentation by Copesan’s Ari Rogoway, who said wearable technology is becoming more prevalent. After showing several innovative examples, he said one thing PMPs struggle with is help in the field. Wearable technology may one day be the solution. Currently, wearables are geared more to fitness, but that will soon change, Rogoway said, as he highlighted innovative watches, glasses, armbands and walking devices. The coolest wearable he demonstrated was a pair of conductive gloves that act like a Bluetooth handset. At only $5 a pop, he bought them for his PMPs, and said they actually use them. It wouldn’t be a technology conference without a discussion on security, and Megan Delany delivered. She works for Dentons U.S., and helps companies deal with data breaches. She warned attendees that if hackers can reach a company’s data, they will. “Because of these new facts of life, front and center in regulators’ minds are how management will deal with these data breaches,” she said. Steve Eyring of WorldPay focused on credit card security. Although small businesses are finally implementing technology that allows consumers to use credit cards with chip technology, he says, data breaches will continue to occur. Once you have a handle on your data, what do you do with it? Kevin Burns of Arrow Exterminators said he focuses on the information that is meaningful to his company, and uses it to drive sales. He also uses data from other sources to gain valuable insights. For example, he uses Google and Zillow to find information about current and potential customers, including home values and median salaries. 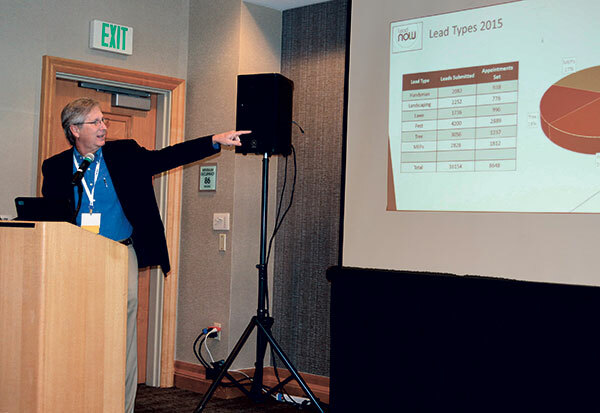 Billy Tesh, Pest Management Systems Inc., also uses data to boost sales. He said technology makes it possible to avoid issues and problems that might otherwise go undetected. 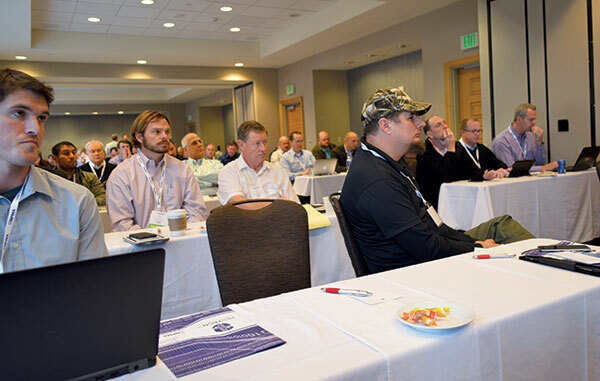 And like nearly every presenter at PesTech3.0, Tesh suggested the best way to learn how your customers feel about you is by offering them a survey. But be sure to make it short. More online: Check out our event pre-coverage in PMP’s December issue, and live coverage online on PMPPestTalk.net, Facebook and Twitter. 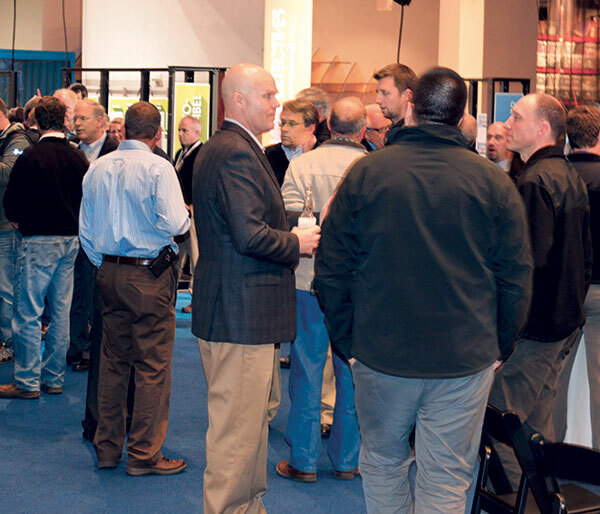 We’ll also be “talking tech” all year long in our Mobile PMP column, and Ray Johnson has additional event coverage here.